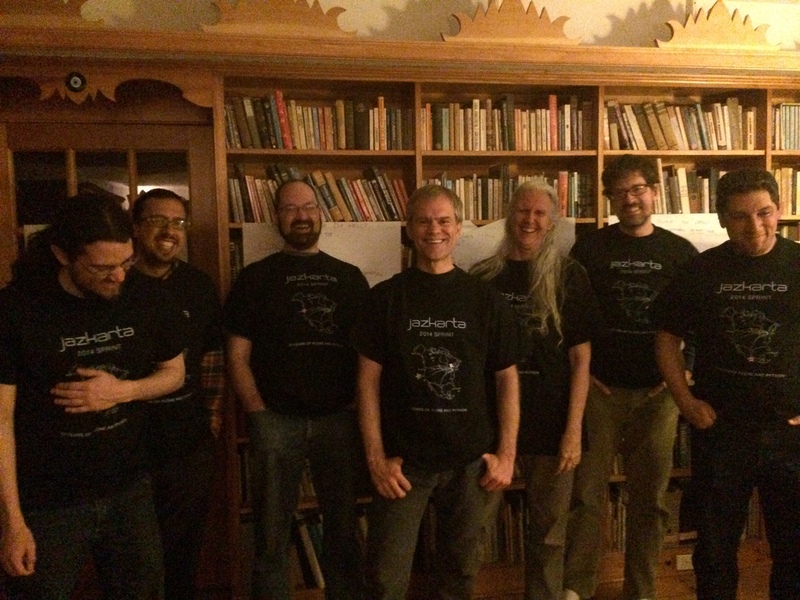 Jazkarta team with brand spanking new t-shirts! For the last three days, the Jazkarta team has been enjoying delicious meals lovingly prepared from local farm ingredients by Sally and her husband Doug, walks in the thawing New England woods, and even a visit to a farm to meet the baby goats who were especially attracted to Carlos for reasons unknown, and showed their affection by nimbling at his pants and shirt. We usually work together from our home offices, and “meet” each other in the IRC channel, so when Sally invited us all to her place for a mini-sprint prior to Pycon, we jumped at the opportunity to meet up in person. Tomorrow we’re getting up early, piling into the rented mini-van and driving 5 hours to Montreal for PyCon! We’ll be staying in a shared apartment just a few blocks away from the conference center. If you want to get away from the PyCon crowds and chill out, you’re welcome to stop by our pad and say hi. Who knows – Sally might even treat you to some of her amazing home cooking! See some photos from the sprint!